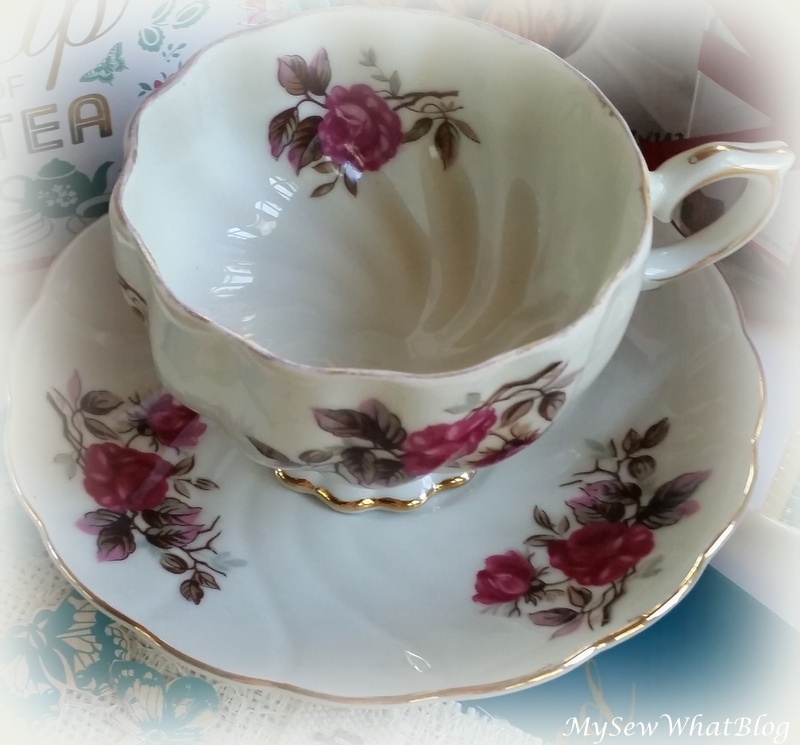 I've made no secrets about a little obsession of mine: vintage and vintage-style tea cups! I love them! I am collecting them! 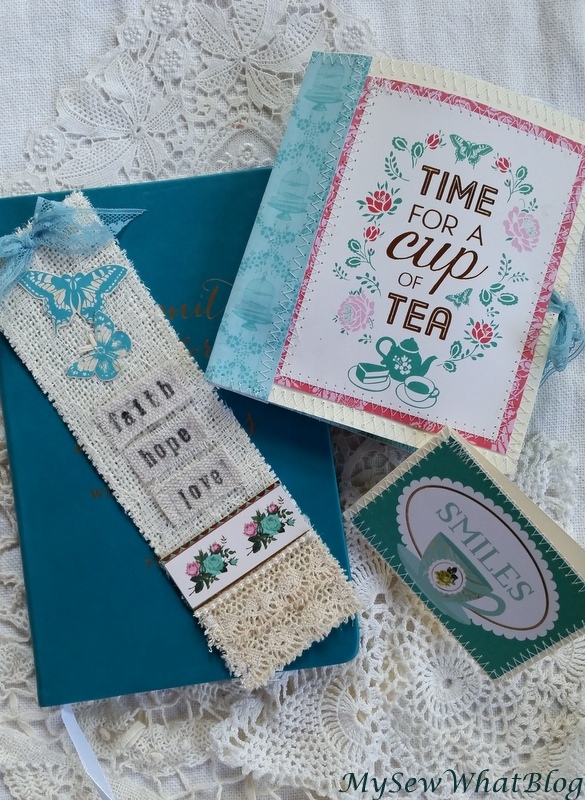 That is why joining in with all the lovely ladies in Stephanie's Tea cup and Mug Swap is a no brainer for me. Stephanie's teacup and mug swap doubly wonderful because besides receiving a beautiful tea cup every time I participate, I also have the joy of shopping for another lady who shares my obsession. How fun is that? None of us really know which is more fun.....the giving or the receiving! But I can tell you that the whole experience from waiting for Stephanie to give us the name and address of our recipient, to anticipating a tea cup package in the mail, waiting to hear that our carefully wrapped packages have been received, to emailing and chatting with our givers and recipients and ultimately reading about the reveals--it is a couple of weeks of good old-fashioned, kid-styled fun! Truly, it's like being a kid again and I just love it! I am so grateful that Stephanie arranges this for all of us. She is a blogger's blessing for sure! 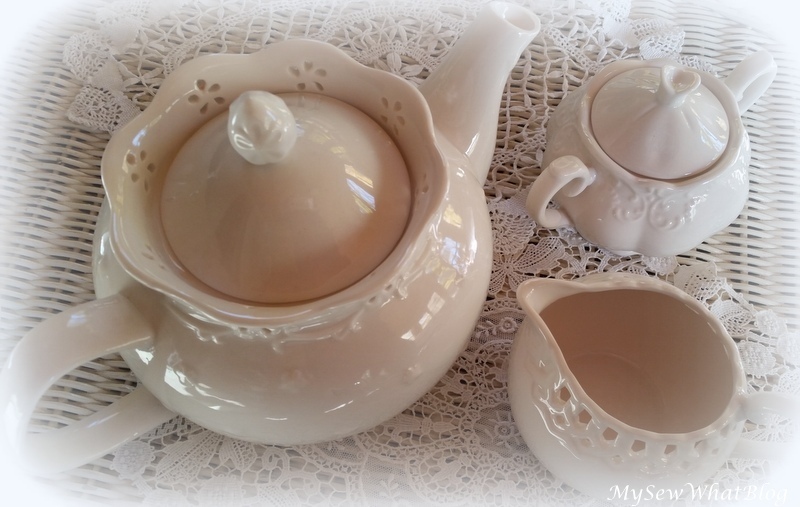 The person I had the pleasure of buying a tea cup for is Marilyn who blogs at Mountain Top Spice. 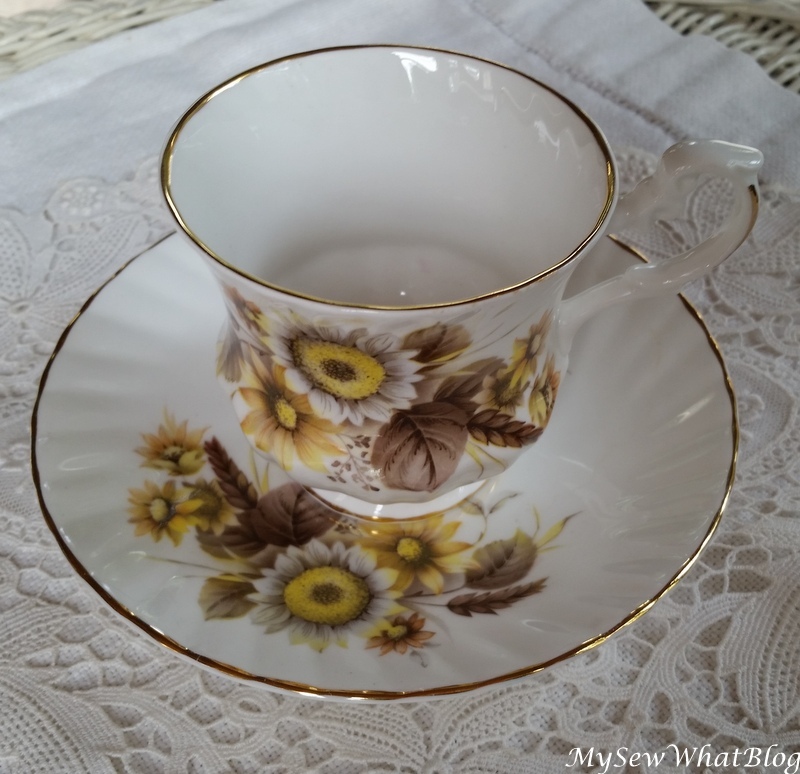 I purchased a tea cup for her at a favorite local antique shop. Here is the tea cup I gave to Marilyn! I fell in love with the unique shape of the cup and the rose design inside and out. These are the other goodies I packaged with the teacup. I packed it all up, sent her an email to let her know it was coming and we have exchanged several emails since then and she sent me the sweetest handmade thank you note and bookmark. So sweet! It is such a fun way of meeting and getting to know someone! It has been a pleasure getting to know Marilyn. She has a lovely blog and her adventures living in the Idaho woods with her menagerie of animals is fun to follow along. She has chickens, which is a bit of a dream of mine, but my husband, unfortunately does not share that particular dream! So I am living out my chicken dreams vicariously through Marilyn! NOW....for the teacup I received as well as the gift of friendship from another blogger, Kitty who blogs at Kitty's Cozy Kitchen. Just as you might imagine from the title of her blog, she has some incredible recipes and her photos are sweet-- kind of retro/vintage and she zooms in so close to oozing butterscotch frosting that it makes you want to whip up a batch at very late hours of the night. Yes, I nearly did that one evening, close to midnight but I grabbed a hold of my senses. Yesterday I purchased some ingredients to make a batch of her snickerdoodles. YUM! Hopefully I will find some time this weekend to whip some up. Here is the teacup I received from Kitty! I love the color combination of browns and yellows. The gold edge is always such an elegant touch. I just love it! ....and look at all the goodies that came with it! 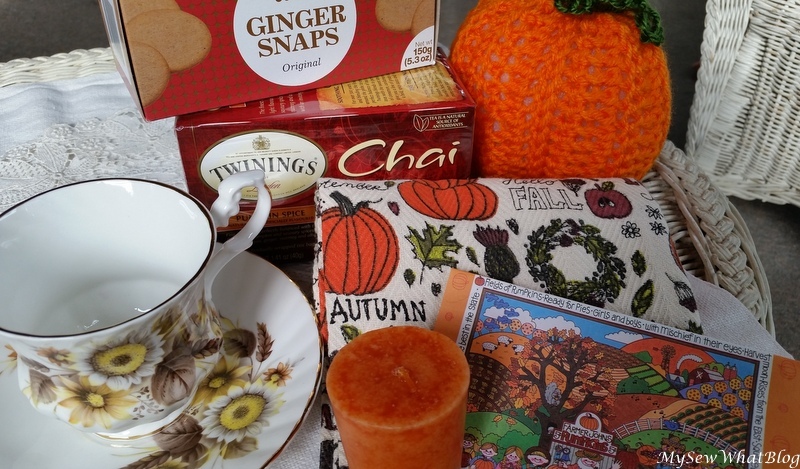 All my favorite fall colors, flavors and scents....ginger snaps are one of my favorite cookies. I am still searching for a ginger snap recipe that produces a crunchy cookie! Look at the adorable pumpkin that Kitty crocheted! It's so cute! 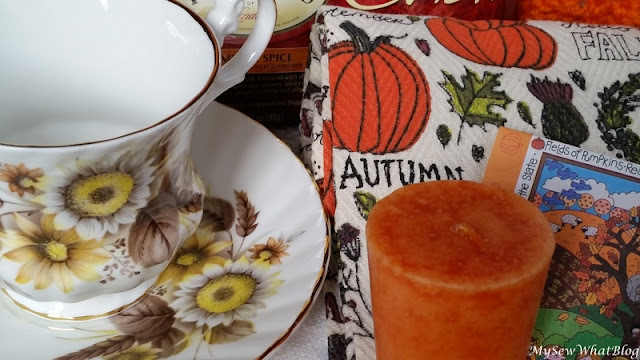 There is also a sweet Autumn dish towel which hangs in my kitchen, some delicious chai tea--pumpkin spice flavored, and a votive candle which I burned right away with my first cup of tea. The tea was delicious. 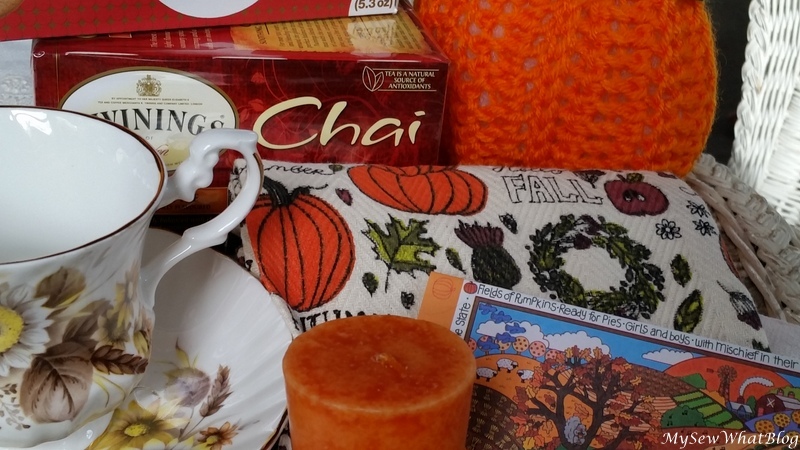 I did not even know that Twinings had Chai tea in a Pumpkin Spice variety. I will be adding that to my grocery list this week because I am almost out of the tea already. I drink a lot of tea! What an amazing box full of autumn blessings! I received the nicest little note from Kitty on a sweet vintage autumn note card pictured above right. We have also exchanged several emails since the swap. Many, many thanks to Kitty for this wonderful collection of autumn gifts.....and each item was so very carefully packed! and this lovely, lovely teacup, I will treasure it! and passed the cake to me." 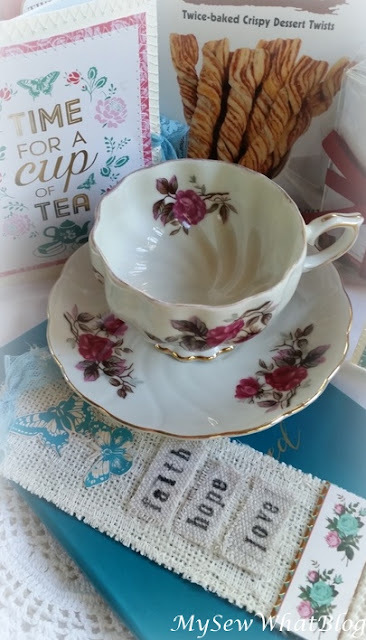 PS Feel free to stop by Stephanie's Blog at the The Enchanting Rose to see all the beautiful tea cups and mugs given and received during this swap!